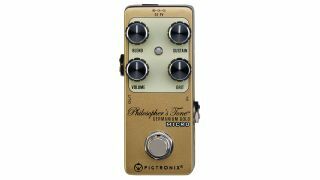 Pigtronix has released its latest take on its ever-popular compressor, the Philosopher’s Tone Germanium Gold Micro. The GGM takes the original PT optical sustain engine and allows players to mix in a layer of germanium distortion with “a smooth top-end and rich midrange response”, says Pigtronix. On the clean side, there’s the usual blend, volume and sustain controls, while the Gold incarnation adds a grit control to blend in the germanium distortion. Elsewhere, there’s true bypass switching and 9V power supply operation, which is doubled internally to increase headroom, clarity and output. The Pigtronix Philosopher’s Tone Germanium Gold Micro is available now for $134. See Pigtronix for more.